Environmentally sensitive property, not publicly accessible. 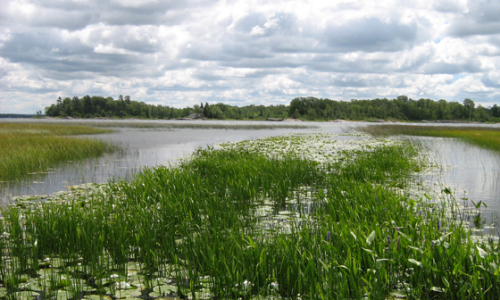 The Port Severn Wetlands property is a large area that extends from the Honey Harbour Road to the southern extent of the mainland where the Trent Severn Waterway meets Severn Sound and Georgian Bay. The lands transferred to GBLT include extensive examples of coastal wetland and associated upland buffer with a mixture of young forest and open rock barren. The entire shore is part of the Potato Island Wetland, which is a combination of graminoid, cattail, bullrush and mixed shallow marsh types. The property supports critical habitat for three threatened species, Eastern Foxsnake, Blanding’s Turtle and Least Bittern as well as habitat for a number of provincially and regionally significant plant species. The wetlands in particular are areas of high diversity that also support habitat for fish spawning.